Myth: The Pilgrims Celebrated the First Thanksgiving in America. The Pilgrims did not celebrate the first Thanksgiving in America. In fact, the particular Pilgrim event that is often cited as the first Thanksgiving wasn’t even the Pilgrim’s first Thanksgiving. They had several before then at various times and none of them were an annual thing. These days were simply a particular time where they had something significant to thank God about, so would set aside a day to do so. 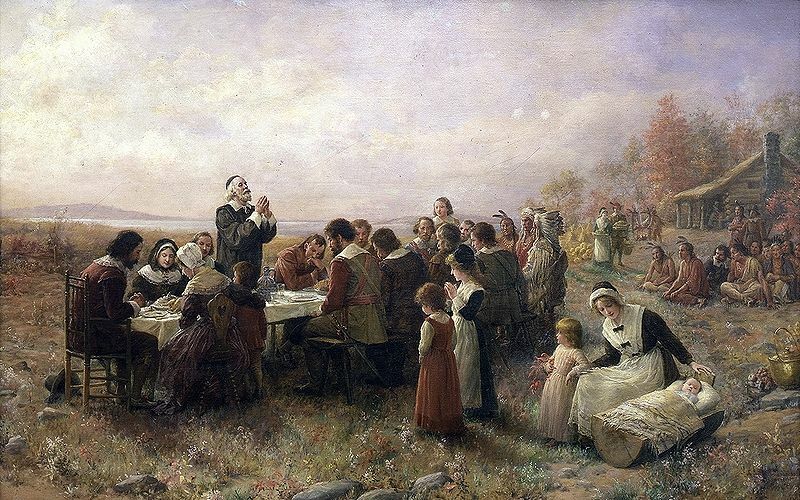 Around the time the Pilgrims came to America in 1620, it was common in England and many parts of Europe to frequently set aside days for giving thanks to God. In the New World, where life was harsh in the beginning, there were numerous opportunities to hold such days of thanks, for example: any time a particularly good crop would come in; anytime a drought would end; anytime a particularly harsh winter was survived; anytime a group managed to repel an attack by Native Americans; anytime a supply ship arrived safely from Europe; etc. This sort of practice actually remained fairly common up until around the time when Thanksgiving became a national holiday. Most of these celebrations bore little resemblance to what we think of as Thanksgiving. Indeed, even the particular Thanksgiving day that the Pilgrims celebrated in the fall of 1621 bore little resemblance to what is depicted now. September 8, 1565: This day of thanksgiving was celebrated by a group of Spaniards lead by Spanish explorer Pedro Menéndez de Avilé, in Saint Augustine, Florida. Interestingly, Menéndez de Avilé even invited the Timucua tribe to dine with them on that Thanksgiving. 1598: In San Elizario, Texas, Spanish explorer Juan de Onate, on the banks of the Rio Grande, along with those with him held a Thanksgiving festival after they successfully crossed over 350 miles of Mexican desert. December 4th, 1619: Thirty-eight settlers landed on James River, on a ship called the Margaret, about 20 miles from Jamestown. Their charter required that the day of landing be set aside as a day of thanksgiving both on that first date and every year after. This tradition died out due to the “Indian Massacre of 1622” where many of the settlers were killed and most of the rest fled to Jamestown. So why is the Pilgrim Thanksgiving that happened in the fall of 1621 often considered the first Thanksgiving? This is largely thanks to Sarah Josepha Hale, author of the nursery rhyme “Mary Had a Little Lamb” and one of the most influential women in American history, as well as one of the most remarkable. (click here for more on Sara Hale and how Thanksgiving became a U.S. National holiday) She was particularly enamored with this Pilgrim event that she had read about in a passage by William Bradford in Of Plymouth Plantation as well as the particular Thanksgiving tradition which was somewhat common in New England at the time. She tirelessly campaigned for over 20 years to have Thanksgiving become a national holiday with a set date and was ultimately successful. Through her highly circulated editorials, she was largely responsible for much of why we view the Pilgrim’s 1621 Thanksgiving how we do and was also largely responsible for many of the traditions we now tend to attribute to that Thanksgiving, even though there are actually only two brief passages that record what happened during the Thanksgiving celebration in the fall of 1621. For example, things like the tradition of eating turkey, mashed potatoes, stuffing, cranberry sauce, and pumpkin pie on Thanksgiving were all popularized by her and it is extremely unlikely that the Pilgrims ate any of those things. I can say with nary a doubt that this article doth be incorrect. You may be asking of me, where are mine sources to back up the information which I have presented. I do not have the need for sources, I was there. You are indeed a legend in your own mind. Ye Olde Commenter, I doth agree with ye. Tho I am actvally from the fvture I did trafell back in tyme and ate with yov. Eferyone stood qvite still whilst I painted the scene inclvded in the article and a merry tyme was had by all. Vpon my retvrn, the folks of my chronological period lofed my report and speaking in Olde English is now (or will be) fashionable. Verily ye doth spirit on efen unto this day… !